Reputation is everything in the Not For Profit (NFP) sector. If an NFP can build a trusted brand that speaks of integrity and credibility, their future is promising. The stronger the reputation, the more attractive the organisation is to work for and do business with, and the more confident government and private sponsors feel funding it. Nothing impacts an NFP’s reputation more than it’s culture. They are inextricably linked. When employees are aligned and passionately work towards the same mission and purpose, and behave and make decisions according to a set of shared and deeply held values and principles, people on the outside notice. And the goodwill towards a NFP grows. 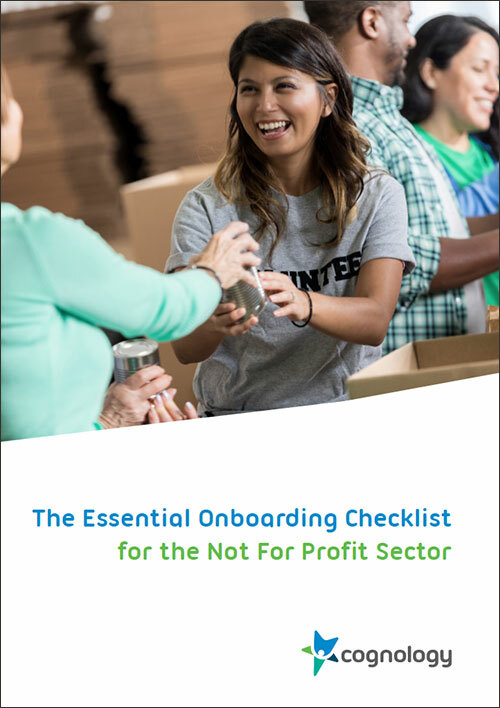 Cognology has put together a sample onboarding checklist especially for the NFP sector to get you started. Download your copy here. A great culture doesn’t just happen. It is cultivated over time. Every decision you make shapes your organisation, as does every person you hire to work in it. If you want the essence of your culture to remain the same over time, you need to help every person that joins your organisation understand and immerse themselves in what it means to work for you and be part of your team. The idea of marinating staff in your culture is a great metaphor for onboarding. Just as leaving out a key ingredient or not giving the marinade time to infuse the food can make for a bland or bad tasting dish, poor onboarding can result in lacklustre performance and damaging cultural misalignment. Unlike traditional orientations and inductions, onboarding unfolds over the first 6-12 months of the new hire’s time with you. During this period, your new employee is supported with a series of interactive formal and informal training, coaching, information sharing, goal setting, feedback, networking and social interventions, providing a sound foundation for the future. The first weeks and months are a highly impressionable period for new hires. Initial experiences can have a powerful effect on a newcomer’s perception and understanding of your culture and ultimately determine their success in a new job. The recipe for great onboarding is simple. You need to tailor a combination of training and activities (ingredients), deliver them at the optimal time, in an effective way, using the right people (method). For more information on best practice onboarding, download Cognology’s Guide To A Great Onboarding Process. Most importantly onboarding shouldn’t be rushed. Effective onboarding should always allows sufficient time to let the metaphorical cultural flavours sink in. Given onboarding of staff is a lot more complex than your average marinade recipe, making a checklist will ensure that you don’t leave any important ingredients out. Employee Welcome Pack – including welcome messages, preboarding information, provisioning tasks and employment documentation. Socialisation and Culture – Steps for introducing your new hire to their colleagues, leaders, the clients and the facilities. Initiatives to help them adapt to the way the NFP operates, the working arrangements, rosters, how you communicate, and what to expect when working in overseas destinations. And finally (and most importantly), sharing the ethos and core philosophies of your organisation including your principles, values and the high standards you uphold. Overseas Workers – It is important to help staff working or volunteering in overseas destinations to understand what to expect when they get there. This could be anything from the visas and documentation they need to immunisations and security provisions to keep them healthy and safe.